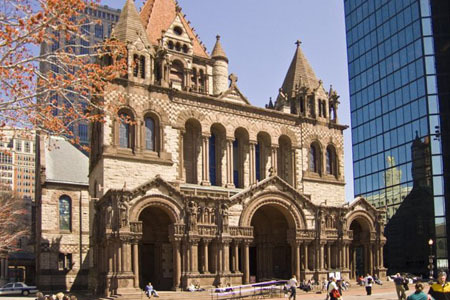 Ranked one of the top ten buildings in the USA by the American Institute of Architects, Trinity was designed by the renowned Henry Hobson Richardson, pioneer of the "Richardson Romanesque" style, featuring Roman arches and heavy, rough-hewn blocks of stone on the bottom and along edges. Completed in 1877, the church is laid out in a Greek cross plan, with equal-sized chancel, nave and transepts, all facing a large open space. The arches supporting the dome on the inside appear Moorish. Pews face the front, but also line the sides. The altar, a truly magnificent work, has a stone communion rail running across the front, and a semi-circular railing that loops around the back. In terms of accessibility, the church building features two ramps (most likely temporary) leading to the sidewalk, and an elevator to the undercroft, where most activities are held. I saw nothing about large-print programs or a "coil" for hearing aid users such as myself. My hearing aids come with a special setting that helps one filter out surrounding noise, making it possible to hear things fairly well. But for somebody with a less-sophisticated type of assistance device, hearing things might be a problem. There was much noise coming in through the open rear doors. On the day of my visit, Trinity Church was shrouded in canvas, as a major refurbishing project is well underway. This will include roof repair, stone repointing and mortar repair, applying protective glazing for the stained glass windows, cleaning and repair of the stone structure and the statuary of the west porch, rewiring and repair of the electrical system, upgrades of the fire protection and life safety systems, and restoration of two murals. 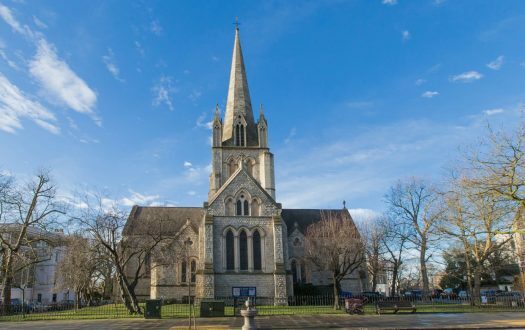 A well-known institution, Trinity is renowned for its organ recitals and other cultural events, services to the homeless and other persons in need, and a wonderful series of workshops held each Sunday that feature phenomenal speakers. They have a special fellowship for Nigerian Anglicans, and make an effort to include everyone. Sitting at one end of a large plaza with fountains, trees, benches and food vendors, Trinity is located in the heart of Boston's commercial district. 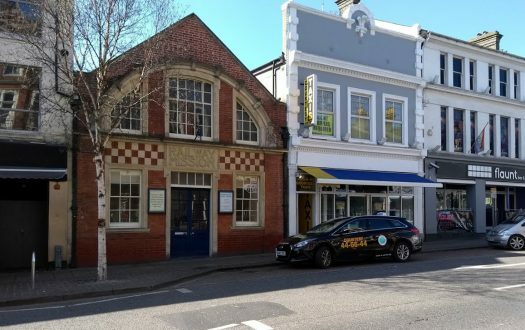 Many shops (often expensive ones!) line the merchant strips, along with some high-end hotels. The fascinating Boston Public Library sits across from the square. The Revd Dr William W. Rich, interim rector. 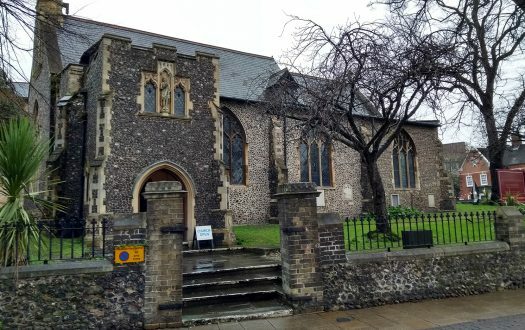 He was assisted by an unnamed priest who may have been either the Revd Rainey G. Dankel or the Revd Rita T. Powell, both associate rectors. Community Holy Eucharist with Summer Choir. As with many churches. Trinity's professional choir take a break for the summer, during which time members of the congregation get to show off their stuff. About 80 per cent full. For a summer day with beautiful weather, that's pretty good! Folks were mostly quite casually dressed for the season. I noticed that the vast majority of those in attendance were white and appeared to be at least middle-class. Well, if you can call it a "welcome." I arrived a few minutes late, and was handed a booklet by a woman who simply said "Go in the side." Yeah, quite. And another great thing about Trinity is that they have individual kneeling cushions upon which people have created needlecraft designs that include the names of departed loved ones. I hate kneeling, on account of my back, but at least I had something nice to look at. Missed that this time. If it was anything like what I experienced on other visits, I'd say a bit noisy, but reverent. Book of Common Prayer (latest edition) and The Hymnal 1982, and a very nice booklet that listed the service on one side and announcements on the other. Also in the pew was the 1992 edition of Wonder, Love and Praise, a supplement to the hymnal, which was not used. Trinity has two fantastic organs, both controlled by one console. The chancel organ, dating to 1963, primarily accompanies the choir, while the gallery or "nave" organ, built by Ernest M. Skinner in 1926, chiefly supports congregational singing. Combined, these have almost 7,000 pipes! Trinity has regular organ recitals. If you attend one, try to sit as close as possible to the middle of the church, where you'll find the "surround sound" of both instruments breathtaking. I arrived late and had to sit in the last row on the side. Street noise from outside made it difficult at times to hear the preaching, plus I was seated behind a very large pillar. Reverent, but not very formal. The service was rather standard American Anglican. 5 – The Revd Dr William W. Rich mentioned up front that this was his first sermon since being appointed interim rector. I've heard him preach before on several occasions, and today's effort was not his magnum opus. Originally I gave it only a 3, but after listening to it again on a podcast, and taking careful notes, I upped the rating to a 5. Perhaps he's swamped with new work. Father Rich's style is informal, and he uses humor and examples from culture to make points. Today he seemed to be a bit preoccupied by the idea of hair. He kept making references and jokes about it – I counted five in all! Two concerned the "funny" hair of a certain prominent public official, and the ""frizzy" hair of his predecessor. I grew tired of the overused follicle imagery. He referred to the film The Lion in Winter and to personal family problems to illustrate jockeying for power – I found the latter to be especially unnecessary and uncomfortable. The sermon hopped around between several key points, and did not always land on target. He spoke mainly about two of the day's readings: Genesis, 21:8-21 (God protects the banished Hagar and Ishmael) and Matthew 10:24-39 (in particular, Jesus's pronouncement that "I did not come to bring peace, but a sword"). The word we translate as "sword" is also used to mean a razor, and perhaps Jesus is saying he has come to bring discernment. There is much jockeying for power in this world. It is difficult for us to love those who behave in ways we do not like. How do we love such persons? The eucharist, and the gift God gives us in this sacrament, is one hint how. The traffic noise. And those silly "hair" references! Absolutely nothing. This has happened several times when I have visited Trinity. They do have a visitors desk, but if you don't seek them out, they won't reach out to you. Things were no different at the coffee hour. Quite good. Only coffee and tea were served. 6 – Trinity offers superb music, (usually) good preaching, and many opportunities both to grow and to help others. I was a bit put off by the lack of a welcome, however. How the aforementioned "difficult" passage in Matthew could well be interpreted as a reference to discernment.